Affymetrix microarray-based gene-expression technology was used. ChipDX reports the discovery and validation of a genetic signature for early-stage colon cancer. The firm is developing an online screening application to enable clinicians to more accurately identify risk of recurrence. Currently, ChipDX is making the algorithm available for research use only through an online gene-expression analysis platform. The firm is reviewing regulatory requirements and partners to market it as a test for future diagnostic use. ChipDX developed its prognostic algorithm by analyzing data from a 2009 study appearing in Gastroenterology of 232 U.S.-based colon cancer patients. 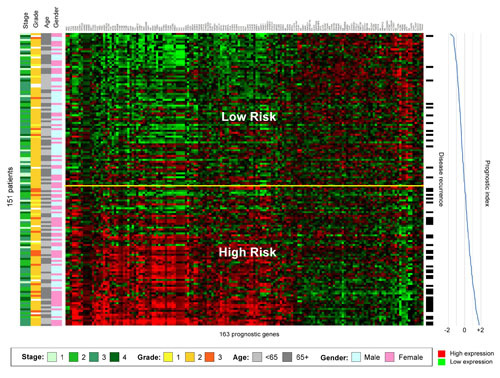 Gene-expression data analysis was performed to identify genes significantly associated with recurrence independent of the patient’s age at diagnosis, tumor grade, or disease stage. An independent group of 60 stage 2 and 3 Australian colon cancer patients was used to validate the discovery and results published in Clinical Cancer Research. “We discovered a set of genes that were strongly associated with outcome, independent to current measurements of prognosis,” says Ryan van Laar, Ph.D., ChipDX founder and CSO. “By combining measurements of these genes, performed with Affymetrix® GeneChip® technology, and a robust predictive algorithm, we were able to predict which individuals were at the greatest risk of recurrence within a five-year follow-up period. The studies in Gastroenterology and Clinical Cancer Research both utilized Affymetrix GeneChip Human Genome U133 Plus 2.0 Array profiles of colon cancer patients. “Dr. van Laar’s discovery demonstrates the advancement in gene-expression array applications and further points to the significance and relevance of this technology,” adds Kevin Cannon, vp of marketing, gene expression applications at Affymetrix. The ChipDX online platform performs multigene diagnostic analysis on whole-genome Affymetrix GeneChip data for research applications. The ChipDX Quality Module™, which is part of the platform, was developed by analyzing more than 3,000 GeneChip profiles of multiple tumor types generated in laboratories around the world. This module ensures that each assay meets a high level of data integrity before a diagnostic analysis is performed, ChipDx points out. After this analysis the data can be submitted to the newly created Colon Cancer Module, which uses the 163-gene predictive algorithm to generate an individualized assessment of recurrence risk in real-time. ChipDX is also developing microarray-based tests including prognostic assays for early-stage breast and lung cancer as well as a diagnostic tool for characterizing metastatic or poorly differentiated tumors.